Talking about mental health isn’t always easy. Stigma, barriers and a lack of understanding have often prevented people from opening up about their struggles. A study carried out by the Mental Health Foundation as part of Mental Health Awareness Week (May 8-14) found that just 13 per cent of more than 2,200 interviewees reported living with high levels of good mental health. More than four in 10 people said they had experienced depression and nearly two-thirds of people said they had experienced a mental health problem. But times are changing. Nationally, the Heads Together campaign, which is spearheaded by the Duke and Duchess of Cambridge and Prince Harry, is making strides in shattering the stigma surrounding mental illness. Here in Calderdale, Andy’s Man Club and the viral #ItsOktoTalk campaign, led by ex-Halifax RLFC player Luke Ambler, is breaking down the barriers preventing men from discussing their mental health. And for people looking for a safe, non-judgmental environment to talk about their problems, the Turning Point Counselling Service (TPCS) can offer just that. 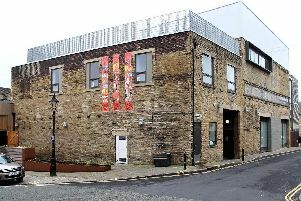 Based in Church Lane, Brighouse, TPCS was set up in 2002 and has thrived in those 15 years. It is supported by churches in Brighouse and Rastrick, with the aim of providing free counselling, supported by donations and grants. While the project is Christian-based, the charity offers help regardless of race, gender or faith. Last month, Prince Harry opened up about his own journey and revealed he had sought counselling after struggling to come to terms with the death of his mother. Gill Hartley, counselling coordinator, says there has been a rise in young people wanting to speak to someone about their anxieties and while a broad spectrum of people attend sessions, people in their late 20s to early 30s form the main group of referrals. She added that in most cases, clients are battling depression and anxiety, which could be linked with other issues including bereavement, historical sexual abuse and domestic violence. TPCS prides itself on being in the heart of the community and will always try to reach out to people who may find it difficult to get to the building. Development manager Simon Jackson said: “Depression can be a really dark place and one of the things that is linked to depression is isolation. People can become isolated from their community and from their family, even if they are living with their family, because we internalise depression. It’s a safe, non-judgmental space here, just for us to say ‘this hour is yours, where do you want to go with it’. Moving forward, the charity would like to attract potential business sponsorship and more volunteers. Visit www.turningpoint-brighouse.org.uk or call 01484 950808.